When will the update come? Where can i get this cargo crane decoration? 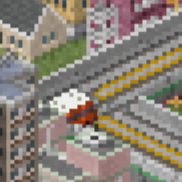 Can you slow down the train by road decorations? Can you fix this bridge? But you can make the impossible possible from doing it. Don't stop. @ danekbel[Posts][PM] can you add the old train design with new because there are only three trains but if you add this trains from your old version there will be Six trains. When the plug-in store was introduced, I didn't want to upload this plug-in to it, because I find it kinda obsolete and undone. But, due to some reasons, I decided to upload it there. And I was surprised. And love how the trains are looking!